As a guitar teacher, Chris has taught for over 30 years professionally all ages from 4 to retired seniors. He has had students go on to sign major label recording deals and graduate from such prestigious schools as Berklee and G.I.T. He has also taught summer school Rock camps including one sponsored by Bootsy Collins. 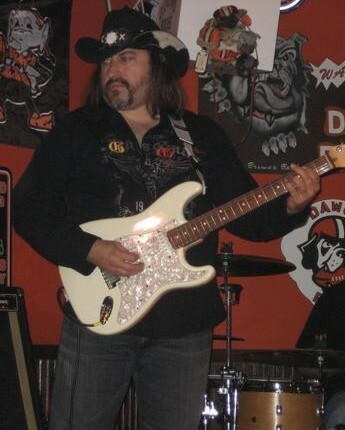 As a guitar player, Chris has performed with Bootsy Collins, hit song-writer, Anthony Smith, and jammed with Lita Ford. He can play a very wide range of styles ranging from Rock, Pop, Modern Country, Metal, Flamenco, Gypsy, Celtic, and other World/Ethnic styles. He is versed in both electric and acoustic and is very much at home with a pick or fingerstyle. Chris has 3 solo CDs out on his own label, Baroquen Records and performs solo instrumentally, in duo’s with vocalists, and whatever band projects he’s involved with. As a solo artist Chris performs at festivals, private parties/events, restaurants, house concerts, and workshops. 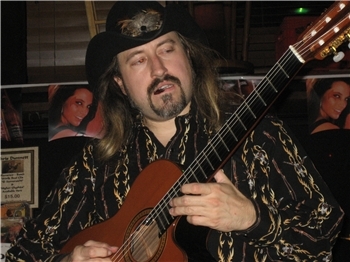 He has performed for The Federal Bar Association, The EPA, and twice at an International guitar festival in Zihuatanejo, Mexico where he was among 22 artists chosen out of over 250. As a songwriter, Chris has studied the art and craft of such writers as Desmond Child, Dianne Warren, and Jim Steinman and has studied directly with such hit writers as Jason Blume, Ralph Murphy, Steve Seskin, Brian White and others. His song-writing style covers Modern Country, Rock, and Pop while his instrumental compositional skills also cover a wide range of World Beat and Ethnic styles such as Flamenco, Latin, Middle-Eastern, Gypsy, Celtic, and Asian modalities. I have taught ages 4 to retired seniors and have had students go on to sign major label record deals and graduate from music schools such as Berklee and G.I.T. Although I can teach songs and certainly enjoy helping students with songs, I prefer to teach students how to play not just what to play. The old saying: teach a man to fish and he can surive on his own. I like teaching students technique and theory but most importantly how to apply it in the real musical world. Not just theory for the sake of theory. I try to make sure what I teach is practical in application and the student can make music with it. Style wise I can teach pretty much anything except Jazz or Chicken Picking. Both are great styles just not my forte'. I can teach beginning Classical guitar but honestly I would recommend someone who specializes in that. I know my strengths as well as my weaknesses. Other than that I can pretty much teach any trick in the book from Fingerstyle to multi-finger tapping. I specialize in most forms of Rock, Hard Rock, and Metal but also have 2 albums out of Latin-based Flamenco World Beat music so I have a niche' for Ethnic flavors and am currently working on a Fingerstyle acoustic CD that will contain some alternate tunnings. I have been told I have a knack for explaining even the most technical of ideas in every day terms and my students always get a kick out of my analogies that I use to get points across. As a teacher I am very patient and as long as the students works at it so will I. If someone is starting from total scratch with no previous musical experience I have my own book that I have put together. Loosely based on Mel Bay Book 1 combined with my years of experience I have found it to be very valueable in learning the basics. Aside from that, once a student progresses past that point they are all different so I cater to the needs of the student rather than use a formula to fit all. Great first lesson. Chris immediately worked to establish where I was in my playing and within 5 minutes was providing instruction. Definitely a step up from any other instructor I've had. Looking forward to future lessons. I’ve fiddled around on guitar on-and-off for years but never made any progress. Now, after just two months of lessons with Chris, my playing has improved by leaps and bounds. So has my understanding of guitar theory. I am very happy with Chris as a teacher. He’s a cool guy too.